It’s not often a new game can be described in just 20 words, but TENZI can: Each player gets 10 dice. The first player who rolls all 10 on the same number and yells “TENZI” wins. That’s the gist of the fast-paced game created by Steve Mark and Kevin Carrolle. The two friends and former colleagues got lucky when they found Celeste, an open-minded toy store owner who gave them a chance to sell their first TENZI games. Ever since, it’s easy to see why the game caught on. TENZI is simple, yet competitive. You get a rush of energy as you roll the dice and then keep tossing the ones that don’t match until all 10 display your chosen digit. You can play by the original rules or opt for one of the many variations, such as Stealzi, which involves stealing other players’ dice. It’s frantic fun for all ages—and there’s no screen, battery, or mouse required. Well hello, there! 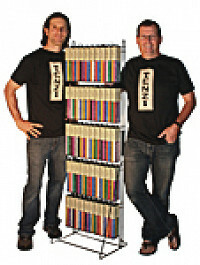 We’re Steve and Kevin, the inventors of a brand new dice game called TENZI. 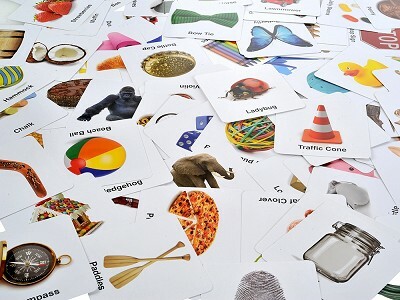 It is without doubt the simplest, fastest and frenziest game ever. (Bonus points to everyone who suspected that “frenziest” isn’t a real word.) And huge points go to the folks at Daily Grommet for spreading the word about TENZI. One of the things people like best about TENZI is that they can make up their own rules and create their own game variations. So send us your TENZI ideas, we'll be here today answering your questions and responding to comments. Thanks, and have a dice day! The details page says that die colors may vary. If you order a two pack can you confirm that you would receive two packs with 8 different colors and not have the possibility of both packs having a blue set of dice therefore limiting your possible number of players to 7 for example? At this time we're not able to guarantee that there will be 8 different colors if you get two TENZI games. We've tried our best to add variety to the color combos, but there are still some repeated colors. 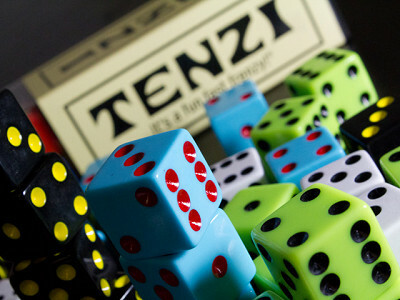 TENZI comes with about seven different ways to play the game, but if you want even more fun ways to play, just email me and I'll send you a list. For example, if you're into big laughs, there's FARMZI where you make the sound of your favorite barnyard animal after each and every roll! I'd love the extra games! This is going to be my stocking stuffer! How many different colors do the dice come in? I want to buy two sets and make sure I get as many different colors as possible. @Ruth VanderLaan: Each game includes 40 dice (ten each of four different colors). 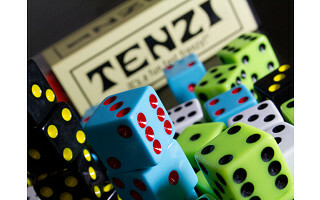 We're checking with the TENZI Team to find out all the different colors that the dice come in. Stay tune. Ruth, There are 12 different dice colors in the current games, making up 6 color combinations. There are a few repeated colors (favorites like red, yellow, blue) in some of the color combinations, but for the most part we've tried to limit the amount of overlapping colors. We are always coming out with new colors, so be on the lookout for that! Thanks! @Ruth VanderLaan if you order 2 sets of 4 at the same time, you will get at least 6 that are different, sometimes 7. @ Judy Teegardin I am sorry but we have no information as to where this game might also be available. Because many Grommets are launched to the market on Daily Grommet, many are initially available only from us. It often takes quite a while for them to be available elsewhere. It is a great game and we've sold a ton of them. It’s not often a new game can be described in just 20 words, but TENZI can: Each player gets 10 dice. The first player who rolls all 10 on the same number and yells “TENZI” wins. That’s the gist of the fast-paced game created by Steve Mark and Kevin Carrolle. The two friends and former colleagues got lucky when they found Celeste, an open-minded toy store owner who gave them a chance to sell their first TENZI games. Ever since, it’s easy to see why the game caught on. TENZI is simple, yet competitive. You get a rush of energy as you roll the dice and then keep tossing the ones that don’t match until all 10 display your chosen digit.